From 1965 to 1969, the Beatles were the animated stars of their very own Saturday morning cartoon series, which aired on ABC. Well, not exactly the Beatles themselves, as the Fab Four had no involvement in the production, other than having their songs shoehorned into each episode. Had they laid down a heavier hand, perhaps we would have been spared the post-Pepper-era anachronism of the ink-on-celluloid clean-shaven, bowl-tonsured quartet clad in the collarless suits that never made it out of 1963. Or the zany cookie-cutter plots involving slapstick misadventures in exotic locales, such as enlisting in the French Foreign Legion. Or the crummy voice work, in which John sounds more like David Niven than any Liverpudlian. But actually, when we were kids these Moptops for moppets were the public image of the Beatles to us, dated as they may have been by 1968. But this blog post is about truly fake Beatles, not true but faked Beatles, and that's where an entity cheekily known as the Beagles enter the picture. They were the stars of their very own Saturday morning cartoon series, which debuted in 1966, created by Total Television, whose most successful programs were Underdog and Tennessee Tuxedo. (You may be able to suss by its name that this was an animation studio set up expressly to sell General Mills cereals by the bushel to impressionable tykes.) Each week, music-loving little nippers would gather around the set to follow the comic misadventures of the titular singing and playing pair of canines, one tall and the other short and bespectacled — their names were, no, not Peter and Gordon but Stringer and Tubby. Managed by a scheme-a-minute terrier named Scotty, this literal Mutt-and-Jeff duo would find themselves all bollixed up in zany cookie-cutter plots involving slapstick misadventures in exotic locales, such as enlisting in the French Foreign Legion. Then they would do an original song related to the plot. The Beagles didn't have the staying power of the concurrently running almost namesake series, lasting one year on CBS with a repeat on ABC in the 1967-68 season. Today, due to an odd circumstance (evidently someone who worked on the series died with the masters in his possession, and his wife discarded them), it's consider a lost show, with almost no episodes currently in existence. (The precious few moments that have survived can be viewed on YouTube here and here.) Fortunately for posterity, around 1967 Columbia Records released the Here Come the Beagles soundtrack album on its Harmony subsidiary, compiling the songs featured in the series — and it's a pretty decent set. Produced with the involvement of soundtrack composer Charles Fox (Barbarella, Love American Style, Happy Days), the anonymous studio singers and players standing in for the Doggy Duo laid down the Beatles-style rockers and ballads with panache, while also showing strong leanings toward garage rock and what would soon be termed bubblegum pop on other tunes. Most important, without the Beagles, "Sharing Wishes," the greatest love song about dishwashing ever recorded, would not exist (see below). damn good simplifuied caricatures on those toon beatles though...from paul's sleepy eyes to george's horse face and john's lack of visible eye-white and trademark nose. ringo's nose is obvious, but they got his eyes and chin right too. they got my cartoonist's respect. My research tells me that the voice talent behind John and George on the Beatles cartoon was Paul Frees, also the voice of Ludwig Von Drake and the Undeer. Class warfare on Saturday morning TV. Great stuff. 6 months, it was thought that he was really Paul McCartney recording under another name. Beautiful beatle-esque songs, and he sounded just like McCartney and played all the instruments. His career is a very long and somewhat sad story.. I loved the guy way back when, and still play his records. I think he would be a great addition to your series. Beloved NYC children's show host (for those of us old enough to remember) Sandy Becker did the voice of the Beagles' Stringer! Emitt Rhodes is definitely on tap for this series. Between his Merry Go Round and solo stuff, there's quite a lot to go on. 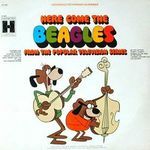 "Here Come the Beagles" was reissued on CD in the mid-90s together with the Banana Splits LP and EPs. Not sure of its legality (the label was "Hollywood Library"), but it sounds great. The Beagles is one of my favorite cartoons. I've got two more episodes other than the ones posted. Great stuff on this Fake Beatles blog, all around.